If you’re in the market for a quality food product that will improve the overall health of your pond fish and leave them in excellent, sparkling condition, then you should switch over to Harz Wardley Pond Floating Fish Food Pellets for their needs today. Hartz Wardley is one of the largest fish food manufacturing companies in the United States, and they’ve been in the industry since 1950 – and they’re also one of the original founding members of the American Pet Products Manufacturer’s Association. They have a long history of quality products, and they clearly have the health and wellbeing of aquatic pets and their owners in mind when formulating and designing their products. 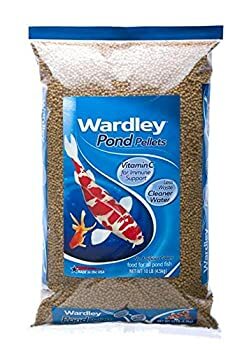 This makes Hartz Wardley Pond Floating Fish Food Pellets the perfect product to consider when you’re looking for an affordable and good quality food source. These floating fish food pellets have no artificial colors, and is made for all types of pond fish – so you don’t have to worry about special diets or requirements. The Hartz Wardley brand of fish food products is also fortified, in this case with extra Vitamin C to ensure that your fish are getting allot the nutrients they need through their diet. There are several more reasons why you should consider purchasing this for your pond fish, including the fact that the pellets serve more than just one purpose: In addition to feeding your fish, the pellets also aid in keeping the water clean and free from impurities that can affect the long-term health of your fish and the entire pond. If you’re interested in this product, the manufacturer has also kept the needs of individual owners in mind, and you can order just as much as you need at one time – in bags of three, five or ten pounds, depending on how much food you will need at any one point in time.